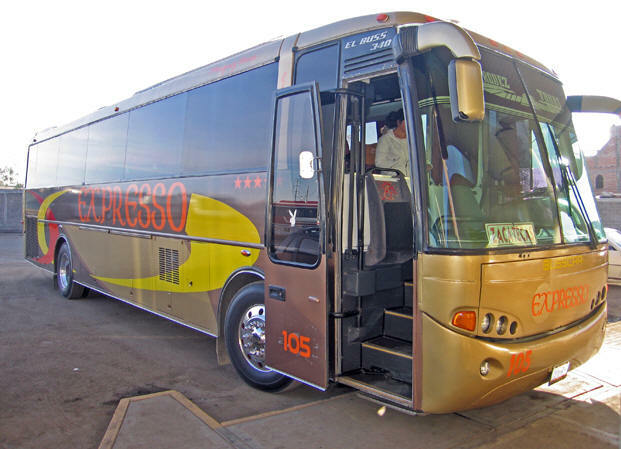 In order to continue our journey on to Guanajuato, in the Mexican state of Guanajuato, we caught an 8:30 a.m. bus from Jerez to return to the transportation hub of Zacatecas. What with one thing and another, we missed the 9:25 a.m. bus Zacatecas - Leon - Guanajuato, so we reached this fine city later than we normally like to arrive in a new place. It was cold and dark outside, and for not doing much this day, somehow we were both exhausted and hungry. Roomy comfortable buses make traveling in Mexico easy. We shared a cab with Christina and Josh - newlyweds whom we met on the bus - to El Hostelito, which was no longer El Hostilito anymore but another hostel instead. Upon arriving, we found that there was only one room available, a 4 bed dorm room for 100 Pesos per bed. As you can imagine the honeymooners chose to lodge at another place and we took the upstairs room with a balcony and view. Immediately I went to the kitchen and began banging around, preparing dinner when the older woman who owns the lodging came up to me and politely asked if there was anything that I needed. I said to her in my best Spanish, "No thanks, I have everything but if you could tell me where the trash is…" After graciously showing me the trash tin in the corner she then says "This is our personal kitchen and not for public use." I stop mid-action with my eyes wide open in embarrassment and surprise and begin apologizing profusely. I had not expected this turn of events in the slightest. The view just outside our hostel. Beautiful, colorful buildings on clean, well-kept streets. Sweet woman that she was, Senora Vidal made a point of telling us that because we were older, more responsible and clean - not like the younger kids who stay here - we could use her kitchen. After eating, I made sure the kitchen was immaculate. The next morning Senora Vidal lets me know that she has straightened up her kitchen so that we will now have plenty of room to cook! How thoughtful was that? When we went out for the day I purchased a half-kilo of fresh berries and gave them to her and her son as a gift. Her son runs the internet cafe downstairs. Nothing like an awkward moment to make fast friends! 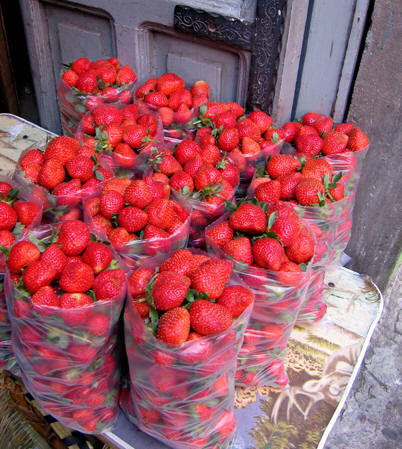 Delicious, sweet strawberries in kilo bags for 20 Pesos each bag. 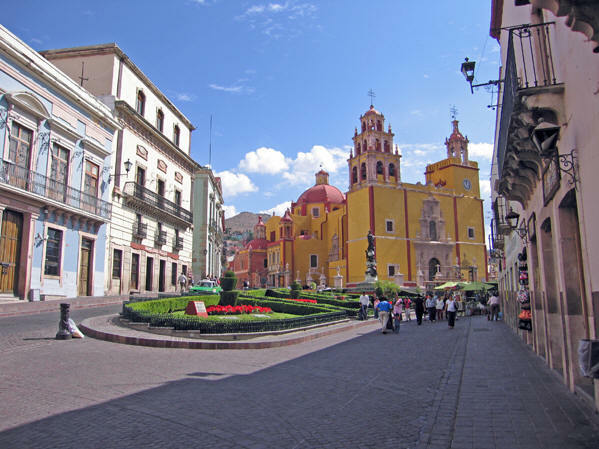 Guanajuato was founded as a town in 1554 and received the designation as a city in 1741. 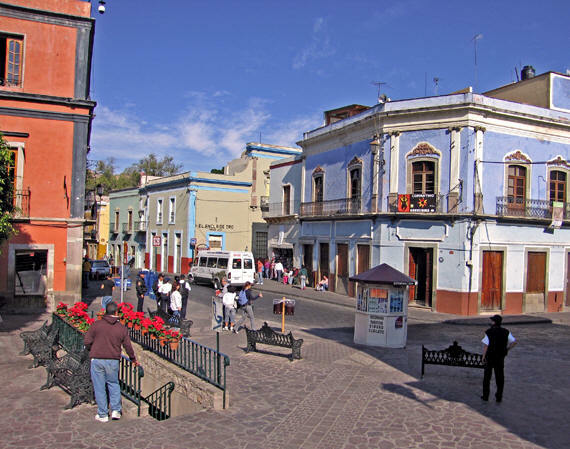 It is located in one of the richest silver mining areas of Mexico, and is well known for its wealth of fine colonial-era Spanish architecture. The historic town and adjacent mines are a designated World Heritage Site. 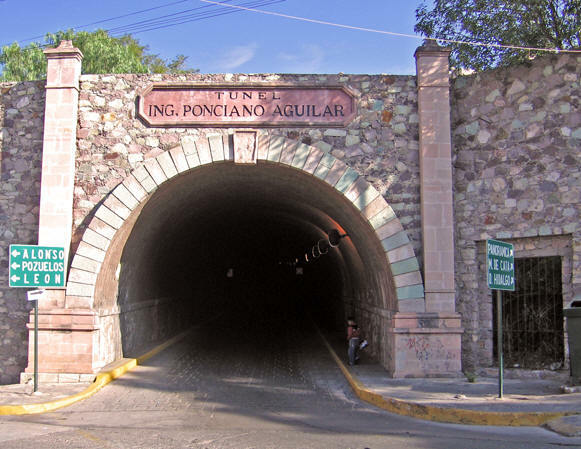 One of the most notable features in the city of Guanajuato are her tunnels. The steps in this photo lead down to a completely different world underground where cars and busses zoom through and pedestrians walk freely and uncluttered by traffic on the streets above. 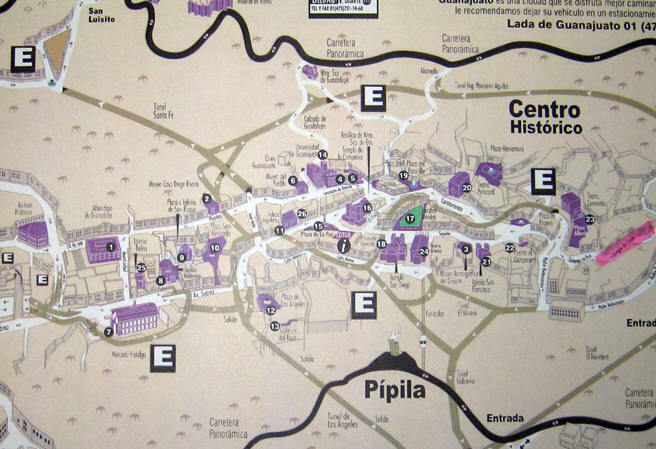 This map gives you an idea of the city with parking, Estacionamiento, marked clearly with the capital 'E.' 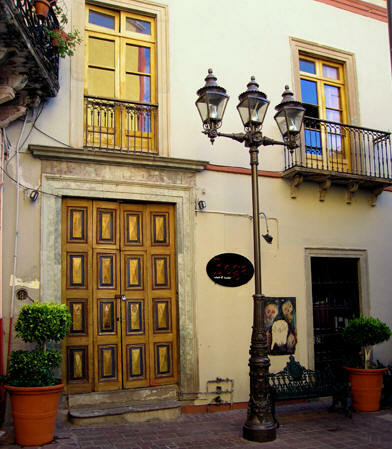 Our hostel is in the Centro Historico area. The tan lines on this map show the tunnel system. 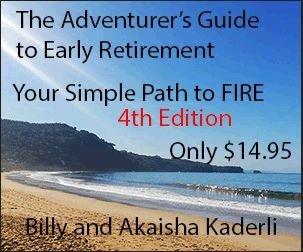 Being a newcomer, when you're traveling underground you have no idea where you will come up. 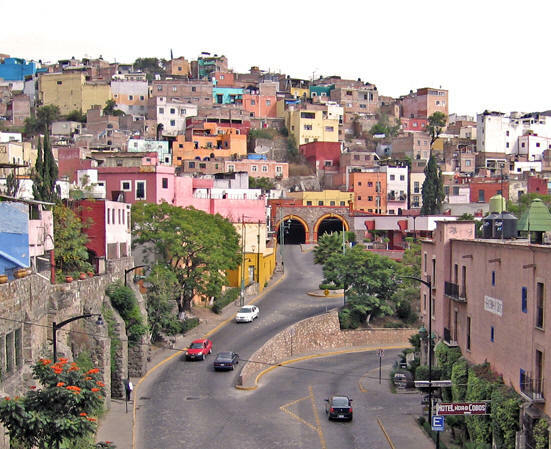 The city was originally built over the Guanajuato River, which flowed through tunnels underneath the city itself. However, after years of raising buildings to accommodate repeated flooding, in the mid-twentieth century, engineers built a dam and redirected the river into underground caverns. The tunnels were lit and paved with cobblestones for automobile traffic, and this underground road network carries the majority of cars driving through the city today. Hop a bus and whiz through these narrow, winding tunnels for 4 Pesos a person. 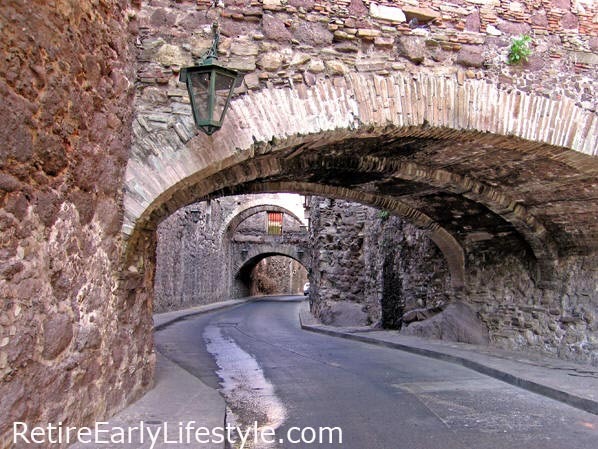 You'll see that cars, motorcycles and pedestrians are all utilizing these cobblestoned passageways. They are organized similar to the subways in NYC. The ones fully underground are eerily lit and give off a gothic glow. Stonework in Guanajuato is riveting. Houses built on the sides of the hill hang over these bridges and archways and sometimes there are hanging plants and colorful flowers that give an artistic touch. Streets twist and curve into alleys, bend apart into stairways, bisect each other at obtuse angles, disappear and reappear in optical illusions and open to secret plazitas with water fountains and no people. 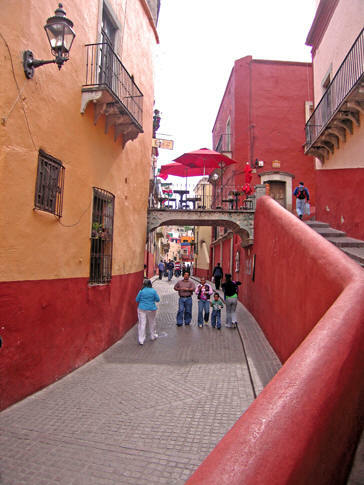 Guanajuato is one of the most photogenic places not only in Mexico but in the world. Streets are clean, buildings are colorful and well-maintained. Wrought iron work is eye-catching. 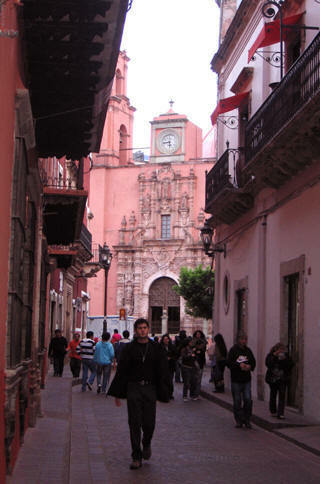 Guanajuato is a wonderful city to explore on foot, and there's never a dull moment. The narrow, winding streets are lined with old colonial structures, wrought iron balconies, and romantic nooks and crannies that can only be fully appreciated by close inspection. 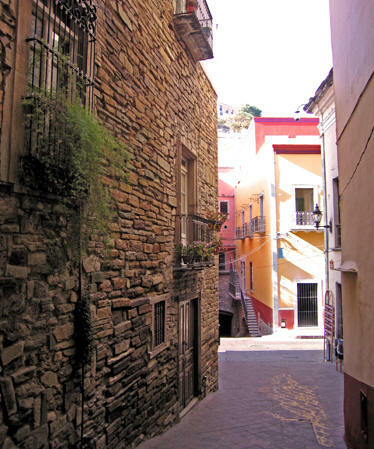 And if you like stonework... you will love Guanajuato. Behind us in this photo is the famous Callejon de Beso, a narrow alleyway named for the legend of ill-fated lovers who shared kisses from their respective balconies. Sort of a Mexican Romeo and Juliet. 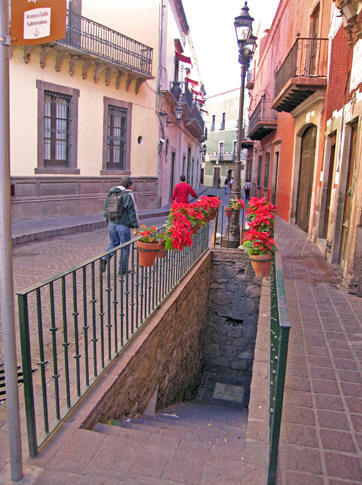 To the left in this photo is the road to the Museo de Los Momias (Mummy Museum), another well known tourist attraction. You also see another entranceway on the left to the tunnels below, and a bus stop in the center. 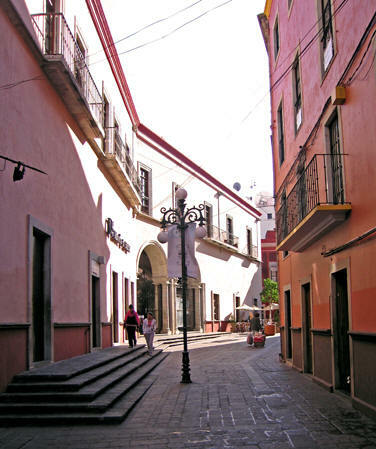 Museo de Los Momias is an odd attraction in Guanajuato, one worth taking the time to visit. 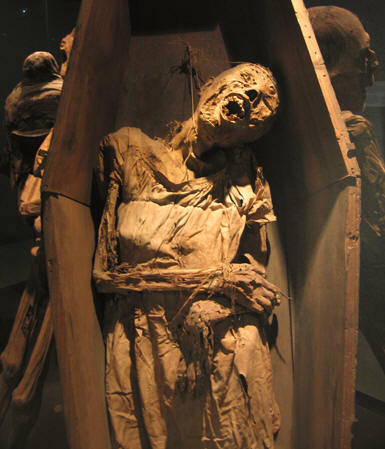 For 50 Pesos a person you can enter the Museo and see the 111 bodies of mummified men, women and children exhumed between 1865 and 1989, that make up the collection. 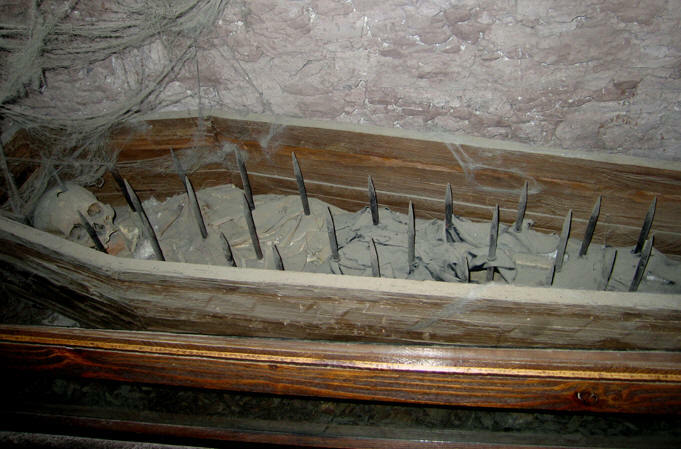 In the late 1800s the town instituted a 'burial tax' for the families of the deceased. When some of the poorest families were unable to pay the tax, their relatives were dug up, and it was discovered that they were mummified. Due to this unexpected event, the bodies were then placed on public view in a purpose-built museum. Walking through the darkened rooms viewing the preserved remains of everyday people from decades ago is something you will never forget. The most gruesome display in the museum is a separate area where you'll see the torture memorabilia telling ghastly stories of how some of the natives were 'converted' to Christianity or sent to their Pagan gods - or so the story goes. We've never seen anything like this before and it was chilling. Understanding that these remains were of real humans and not a Halloween display just cut to the heart. It left us with many questions and few answers. Back outside in the light of day we see that brightly colored, cheery walking streets perfect for pedestrian enjoyment are everywhere. Mexicans are not afraid to use color and these images are captivating. Notice again, not a lick of trash anywhere. 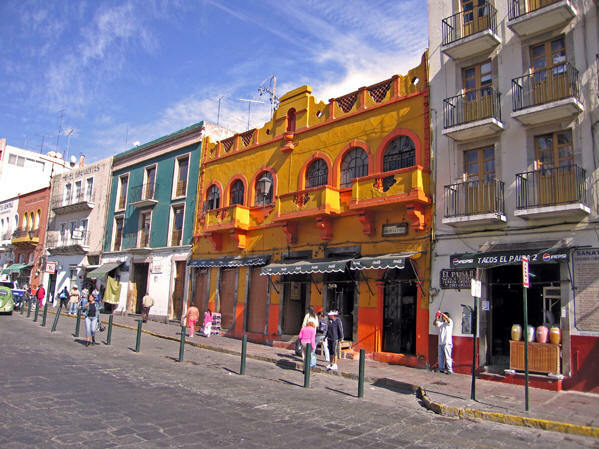 Buildings all over town are colorful in the distinctive style of Mexico. 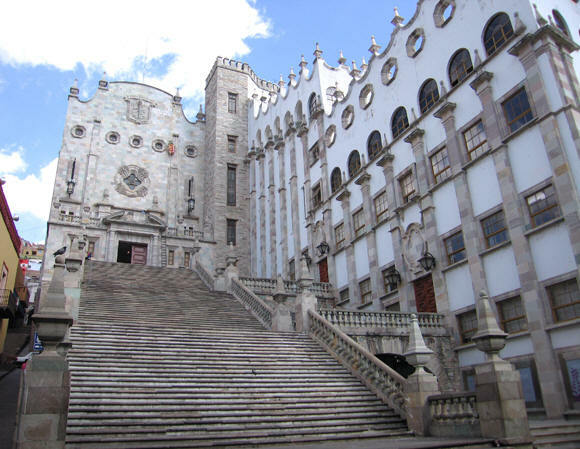 The University of Guanajuato is one of the oldest in the western hemisphere. It has a rocky history due to the expelling of the Jesuits, the Mexican War of Independence from Spain, and financially lean times. These days it is thriving. Built of white stone it shows Colonial architecture and Moorish influence. A solid presence. However, the architectural style is still a controversial subject. 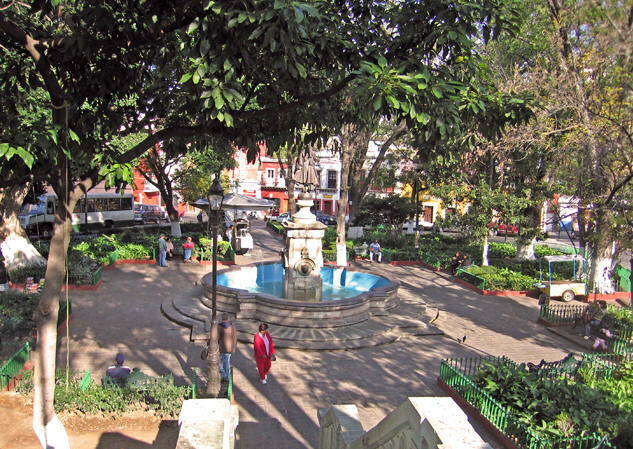 Plazas, fountains and green-filled areas for public sitting and people-watching are delightful to uncover in this beautiful and fine city of Guanajuato. More stonework and artistic expression characterizes a charming entranceway to this restaurant-bar. Tiny nooks and crannies, little secret hideaways, well preserved stonework and tile present photo opportunities on every walk. Golden painted doors and windows, old fashioned street lights and topiary plants. Everywhere you look begs to be photographed! 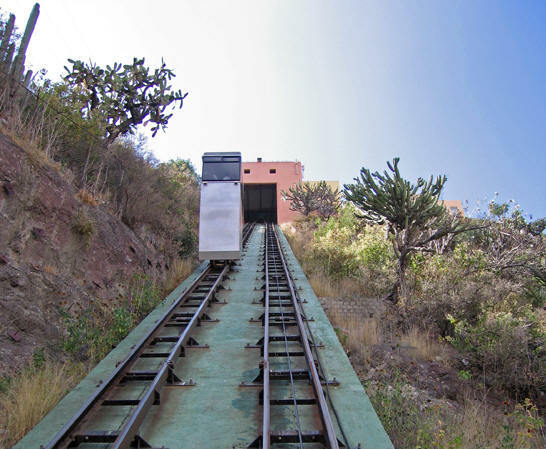 We spent 15 Pesos per person each way to go up the Funicular Panoramico to see the monument to El Pipila - the martyr who set fire to the grain-holding building that the Spaniards were occupying during the Mexican Revolution. What a view of the city from this monument location! 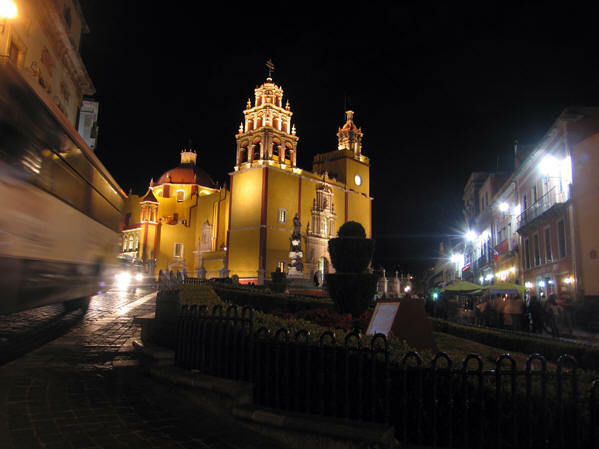 Guanajuato played a major role in the Mexican War of Independence since it is the capital of the state of Guanajuato in which Miguel Hidalgo started the independence movement. In the center of the photo you see the yellow Basílica Colegiata de Nuestra Señora, and to the left of that is the University of Guanajuato. I don't know the name of the maroon domed church to the right. 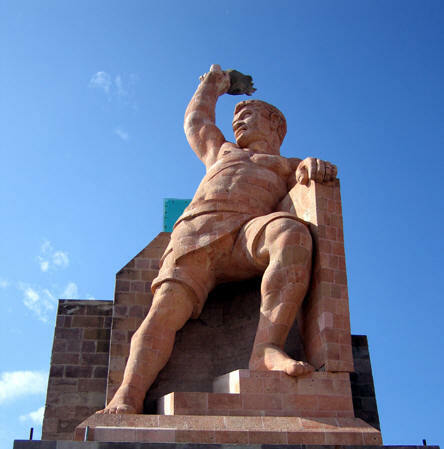 Pipila is a revered revolution martyr who tied a stone slab on his back protecting him from Spanish bullets and crawled to the grain-holding building they were occupying during the Mexican Revolution. He set fire to the gates and while the Spaniards choked on smoke, the rebels moved in to take this military stronghold. 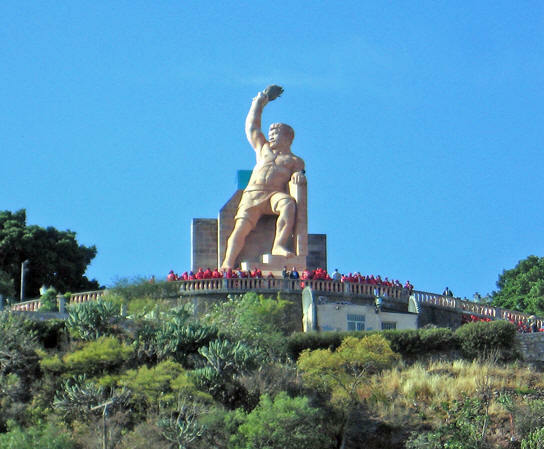 To get an idea of the size of this monument, see the people in the red shirts at the foot of the statue? 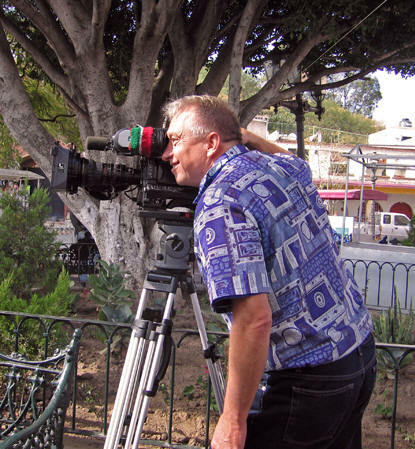 Here's Billy living out a dream and checking to see if the camera is a good fit for him. While wandering around at the top of this Mexican Revolution Monument, we came upon a camera crew for Mexico City TV channel 22 who were doing a documentary. Mexico celebrates 200 years of Independence from Spain in 2010. During the reign of Porfirio Diaz (1876-1911), peasants were cheated out of their land by new laws. From the 1920's through the 1960's, 400,000 square kilometers of land from large estates were redistributed to peasants and farmers. 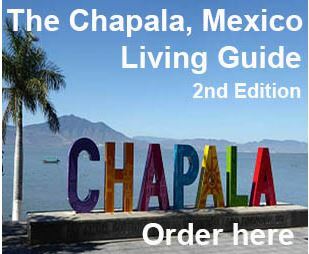 At the top of the monument hill, we saw some vendors making blue corn tortillas with your choice of filling. 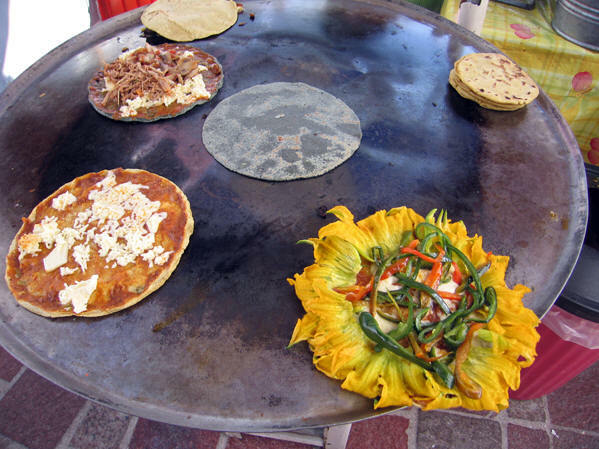 Here you see calbasa flowers with chiles and queso. Another tortilla offers frijoles and queso, and another, pierna, frijoles and queso. Fifteen Pesos each. Plaza de la Paz and the Basílica Colegiata de Nuestra Señora de Guanajuato. Garden areas, outdoor cafes, dazzling skies. 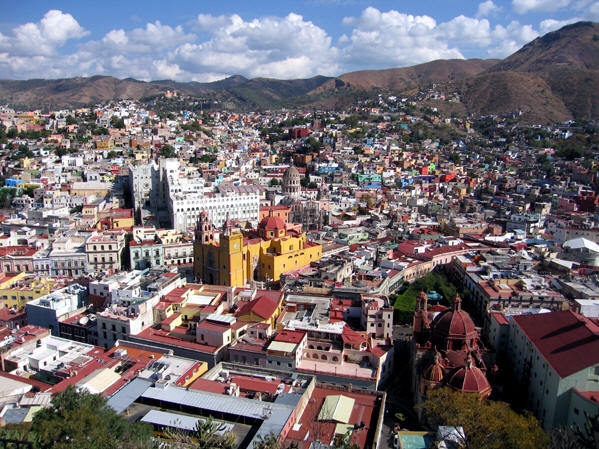 Guanajuato: What's not to love? The same area at night takes on a glamorous air. 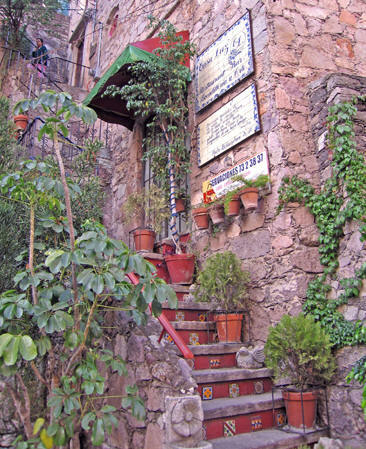 There's always something entertaining to do in Guanajuato. 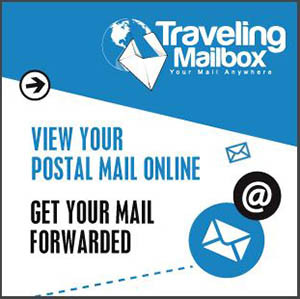 Why not go for a visit and experience this lovely city yourself?